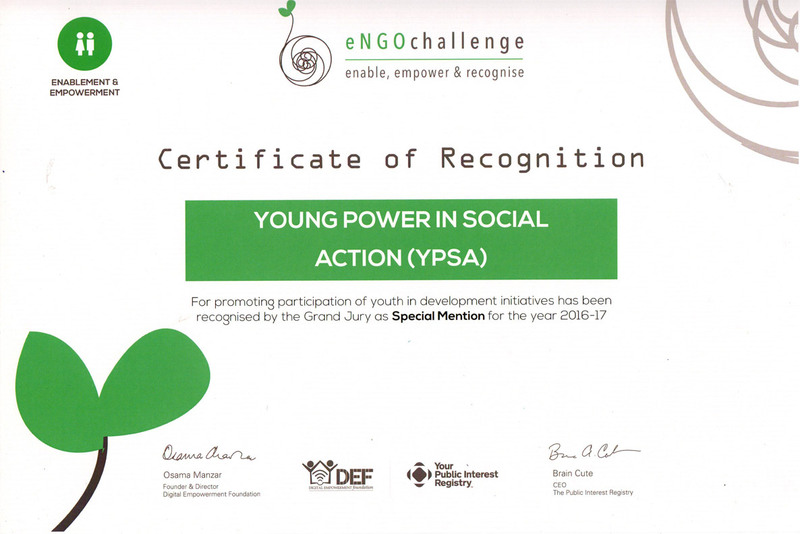 YPSA has been recognized by the Grand Jury of eNGO Challenge South Asia Award 2016 for promoting participation of youth in development initiatives under the category Enablement & Empowerment. The E-NGO Challenge under the umbrella of Digital Empowerment Foundation’s eNGO Programme was put in to conception with an objective to recognize the grassroots organizations doing exceptional work using Digital Tools. The eNGO Challenge aspires to create an ecosystem of NGOs, which use Information Communication Technology (ICT) and digital media tools for good governance practices for the benefit of societies and communities at large. It focuses on encouraging NGOs working in the field of ICT for Development or using ICT4D for mass impact.